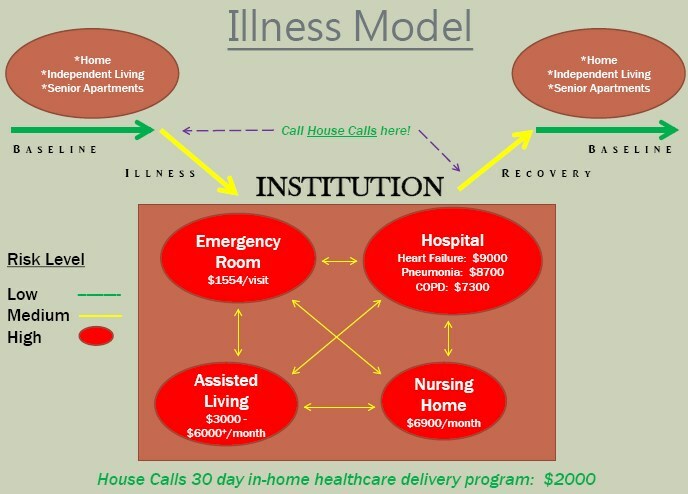 To help illustrate when to call House Calls, let's take a look at the Illness Model. The top left of the model shows a green horizontal line. This indicates when you're at home and are stable and managing quite well by yourself. You don't need House Calls here, but just be aware that we're available. But if you get sick, and your health starts failing as shown with the yellow caution line, then that's the time to call House Calls. Make the call early, BEFORE your health gets in peril and you need to be admitted to the hospital. House Calls will be right there for you. We'll work with your doctors and start arranging and coordinating all the services you need to try to get you well again. Another time to call House Calls is when you've been in the hospital and are going to be discharged home and need help recovering. Be sure to call us as soon as you get home, or even before you actually leave the hospital. We will work with your doctors to help you through your recovery so that you get to be as independent as possible once again. Remember - when you're having trouble managing, make House Calls your First Call.